The opioid system has been elucidated as a potential target for therapy in a variety of neurological disorders including stroke. Delta opioid receptors have been revealed to pose an especially compelling biological function for new neuroprotective therapies. Two distinct therapeutic mechanisms have been characterized for delta opioid receptors, namely, these receptors aid in maintaining ionic homeostasis and initiate endogenous neuroprotective pathways. Specific agonists of delta opioid receptors, such as (D-Ala2, D-Leu5) enkephalin (DADLE), have displayed the ability to promote neuronal survival and mitigate apoptotic pathways. These findings have led to a significant amount of research on this molecule’s potential as a neurotherapeutic. At the forefront of these efforts has been investigation into DADLE’s ability to protect neurons and glial cells following ischemia. Additionally, current research is attempting to reveal the dynamic neuroprotective mechanisms that mediate DADLE’s therapeutic benefits. This review article discusses the scientific evidence supporting the use of delta opioid family of receptors and ligands as a promising target for therapeutic intervention in neurological disorders, with emphasis on stroke. Keywords: Brain diseases, (D-Ala2, D-Leu5) enkephalin (DADLE), Neurodegeneration, Neuroprotection, Opioids, Stroke, receptors. 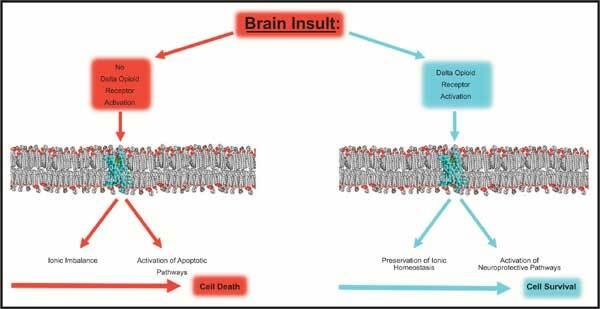 Keywords:Brain diseases, (D-Ala2, D-Leu5) enkephalin (DADLE), Neurodegeneration, Neuroprotection, Opioids, Stroke, receptors. Abstract:The opioid system has been elucidated as a potential target for therapy in a variety of neurological disorders including stroke. Delta opioid receptors have been revealed to pose an especially compelling biological function for new neuroprotective therapies. Two distinct therapeutic mechanisms have been characterized for delta opioid receptors, namely, these receptors aid in maintaining ionic homeostasis and initiate endogenous neuroprotective pathways. Specific agonists of delta opioid receptors, such as (D-Ala2, D-Leu5) enkephalin (DADLE), have displayed the ability to promote neuronal survival and mitigate apoptotic pathways. These findings have led to a significant amount of research on this molecule’s potential as a neurotherapeutic. At the forefront of these efforts has been investigation into DADLE’s ability to protect neurons and glial cells following ischemia. Additionally, current research is attempting to reveal the dynamic neuroprotective mechanisms that mediate DADLE’s therapeutic benefits. This review article discusses the scientific evidence supporting the use of delta opioid family of receptors and ligands as a promising target for therapeutic intervention in neurological disorders, with emphasis on stroke.